This was one of those books I heard about when it first came out and for whatever reason, I didn't pick it up right away, even though I was really excited to read it. I finally decided to pick it up now, and while it didn't completely live up to my expectations, I flew through it and quite enjoyed it. 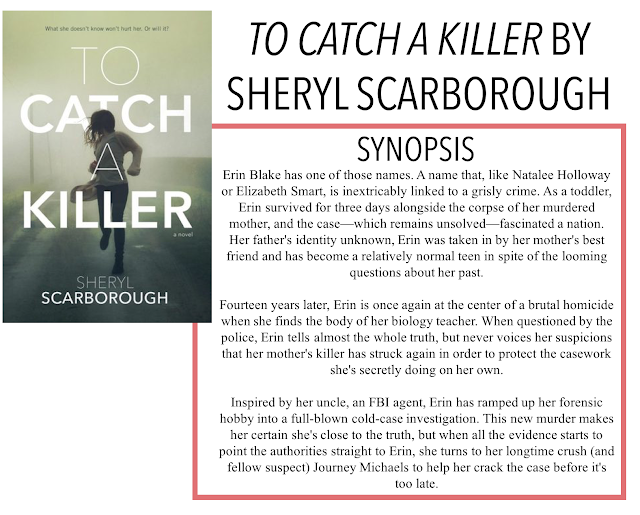 I'm back with another book review, today it is To Catch a Killer by Sheryl Scarborough. The story follows Erin, a girl who is known in her whole community for being the little girl who was left for three days by her mother's side after she was murdered. No one knows who killed Erin's mother or why they let her live. Now, fourteen years later, Erin finds herself at the centre of another murder when she finds her biology teacher murdered. While she is shaken by what happens, Erin thinks that this case might be connected to her mothers, especially when her long-time crush was spotted at the scene of the crime and becomes a fellow suspect with Erin. 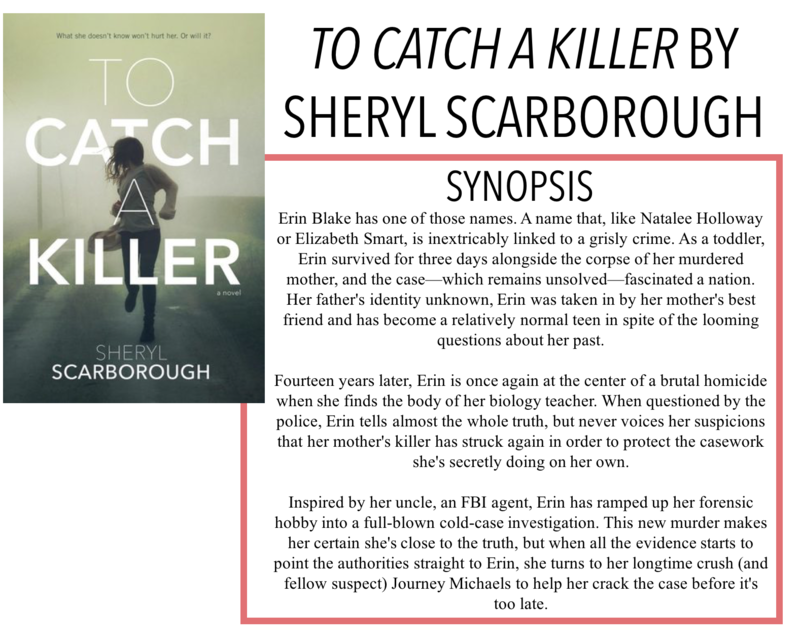 Using her self-taught forensic knowledge and her uncle's FBI know-how, Erin vows to solve her teacher's murder, find her father, and clear her own name. I think the premise of this book was really well done. It was similar to other YA thrillers I've read, but there were aspects that helped set it apart from the rest. I really liked the incorporation of the FBI uncle in the story. It gave inside knowledge to forensics and helped make it a little more believable that Erin, a teenager, would be able/capable of doing the forensic investigating that she did. I find a common problem in these types of books is the improbability of a teenager doing detective work and having the knowledge and equipment to solve these brutal crimes. Scarborough does a good job of creating a decent backstory to explain why Erin and her friends can do what they do, which I appreciated. I'm not sure I fully believe they would have been able to do the things they did and come to the conclusions they do, but I appreciated the effort to close the loop-holes. The one glaring part of this book that really was not necessary was the romance. I could not feel any real chemistry between Erin and Journey, other than the fact she had apparently had a crush on him for years. Their relationship felt odd and unnecessary to the storyline - they could have been friends or even acquaintances and things would have been the same, plot-wise. I am usually fine with a romance subplot in a thriller, but only if it helps the story. And in this case, it really didn't. I think the writing style and pacing of this book really helped it. I was able to remain engaged and interested despite any plot-based issues I had because it was fast paced and easy to read. I found that I read it in one sitting for only a few hours, so it's a great book to read if you are looking for a quick, interesting story. I also loved the forensic elements of the story, which I think also helped keep me interested in the story. Ever since a forensics unit we did in grade 6, I've loved anything to do with forensics: fingerprinting, chromatology, DNA testing. I just find it really interesting, and if you're a bit of a forensics nerd like me, you'll really enjoy this one! Overall, I didn't absolutely love this book but it was interesting and I'm looking forward to picking up the second book in the series.